CHAPEL HILL, OCTOBER 1st: Senator Rick Gunn arrived at 8:00 this morning for a tour of TOPO Distillery. When he purchased our TOPO Organic Vodka at exactly 9:00AM, he made history. That was the moment North Carolina distilleries could legally to sell to visitors and the first time any spiritous liquor has been sold outside of the NC ABC since 1909. Senator Gunn and his team were instrumental in getting the distillery sales bill passed. He addressed the crowd by saying that he "was here to proudly support the entrepreneurs of the state," and added that the pioneering spirit of makers and manufacturers in North Carolina "is really what this state is all about." We are grateful to the entire community of lawmakers who supported this legislation along with the NC distillers, customers and friends who worked so hard to make this initiative possible. Here at TOPO we believe it's about livelihoods and families--from the agriculture, to the manufacturing and the sales. Making North Carolina a place where businesses have the chance to grow is everyone's goal. We asked Senator Gunn how he liked his vodka. "Make mine a Bloody Mary," he said. So, cheers to you, Senator. We made you your very own recipe. And like the conversations this distillery sales law sparked, it's spicy. Combine ingredients in a blender or food processor and mix until you achieve the texture you like. Our version is smooth. Pour into a pitcher and chill in the fridge. In a tall glass, add 1 1/2 oz. 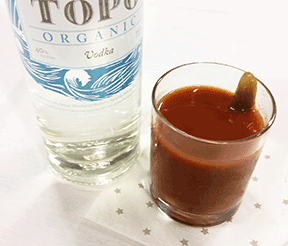 TOPO Organic Vodka then pour in the chilled mix and stir. Garnish with a dill pickle. Or, if you prefer your drink over ice, load the glass up with ice first, add the vodka, then the mix. Gently stir. Garnish with the pickle.